Well, now! What brings you to this page of things that start with w? Wishing for some wonderful ways to have your kids practice the /w/ sound? Well here you go! 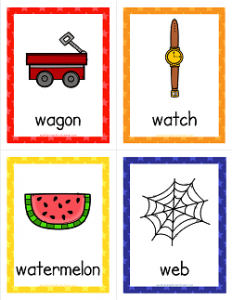 The words that begin with w in this set of eight cards are wagon, watch, watermelon, web, whale, wheel, window, and worm. You will also find a title page card and three other cards with the eight words for your kiddos to read, if not just become familiar with the words and what they look like.